Nothing says breakfast like a big, golden, waffle covered with delicious toppings. With 22 grams of complete plant-based protein in every serving, FitQuick was born from this belief: that the perfect, classic, breakfast shouldn’t sacrifice a thing. They believe that your meal should serve your goals, your tastebuds, and your schedule so easily that it fits your daily routine. This high protein, low carbohydrate, high fiber, nutrient packed mix meets everything you could want to kick start your day, while remaining true to its waffley roots. 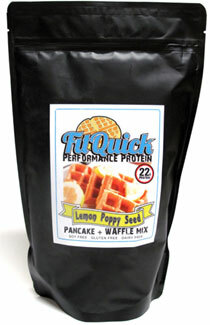 Make perfect pancakes and waffles while getting a healthy high-protein breakfast! Packed with plenty of delicious Lemon Poppyseed flavor in every waffle or flapjack, you might even pass on adding syrup, they're so good! Soy-free and gluten-free, just add your favorite non-dairy milk and you'll be enjoying a stack in minutes. Each large 1.25 lb. (480g) package is $23.99.